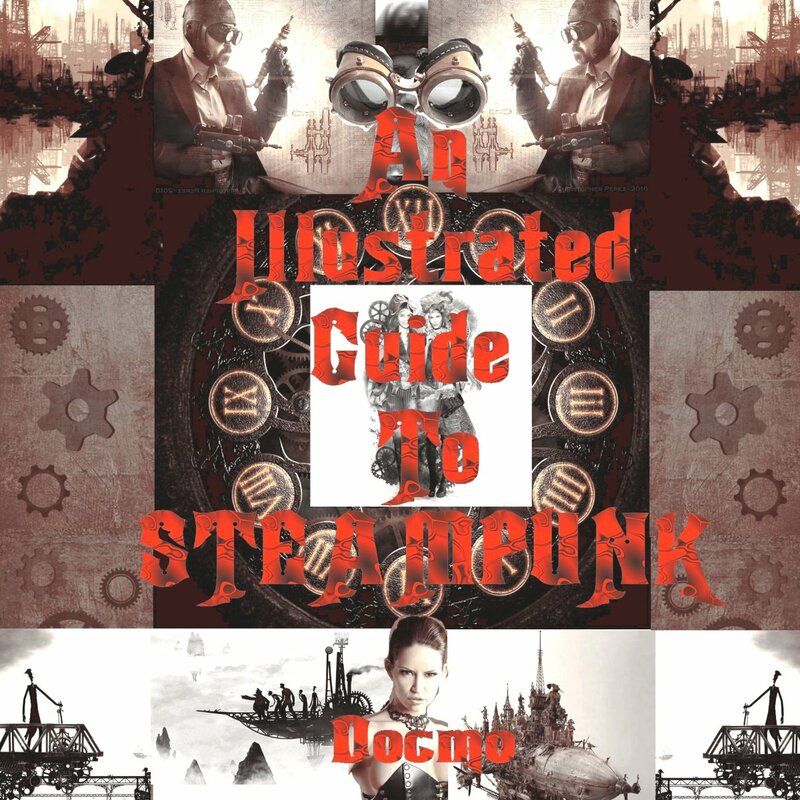 The word steampunk and the genre itself originated in the mid 1980s but has been retro-actively applied to works of such authors as Jules Verne, Mary Shelley and H.G. Wells. The word was coined by Author Michael Moorcock in a 1987 letter written to sci-fi magazine Locus in reference to works of his own and others. The genre often incorporates elements of other fictional works such as horror and historical fiction. There are many examples of the genre that precede the origins of the term by decades. Stories like "20,000 Leagues Under The Sea", "Frankenstein" and "The Time Machine" capture all the elements of a good steampunk story. 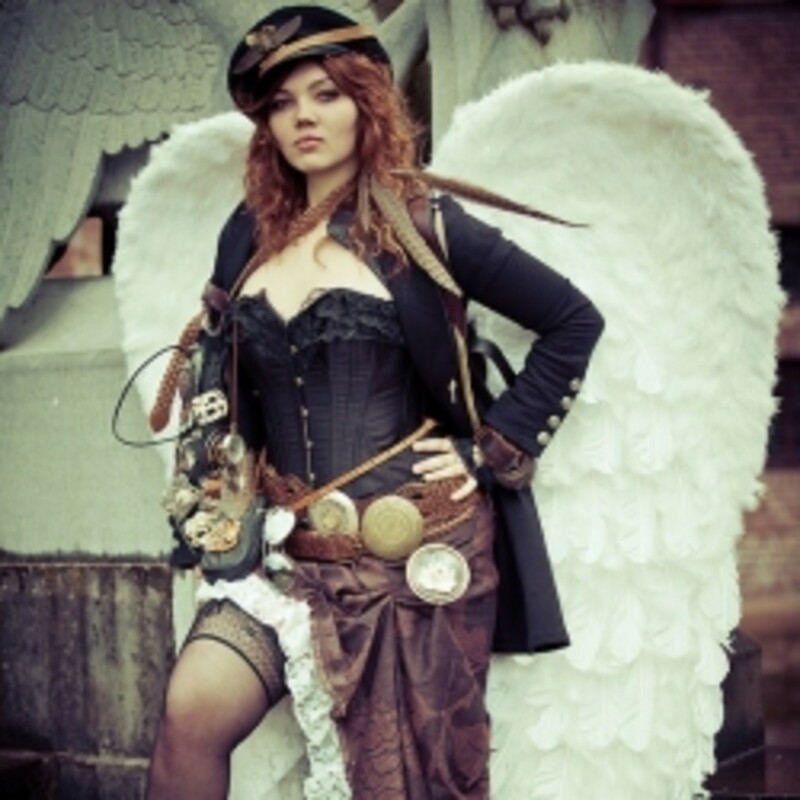 Steampunk, the word itself is unusual but rolls off the tongue with a mysterious air. Just what is it and what does it mean and where does it come from? As a genre steampunk has been around since the late 1800's but it was not widely recognized, or even named, until nearly 100 years later. Steampunk is a futuristic sci-fi genre powered by steam engines and set in a post-modern industrialized Victorianesque world.Early works are stories of imaginary machinery told from the viewpoint of the time. These stories are forward looking and offer a "what if" scenario of life. Modern stories often offer alternate historical accounts of events in Britain and America and may include whimsical machinery, buildings and story lines. 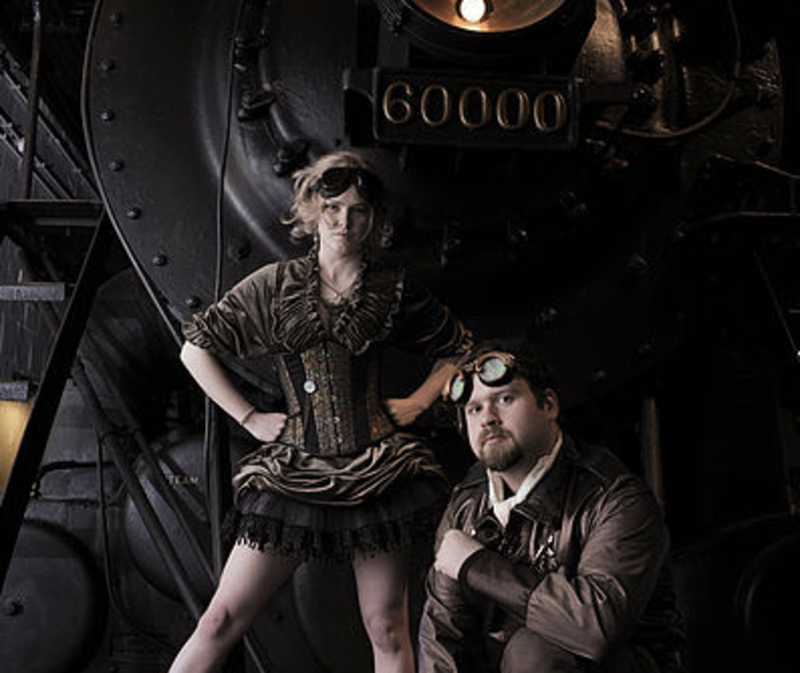 The gadgets and machines in steampunk are based on current or possible technologies but with a fantastical sci-fi twist. Imagine if the people of the 1880's had access to computers? What would they look like? What would power them? Characters are sometimes dressed as if they work in a steam plant, which in effect they do since everything is based on steam. This goggle eyed, apron wearing fashion is what inspired the name steampunk. 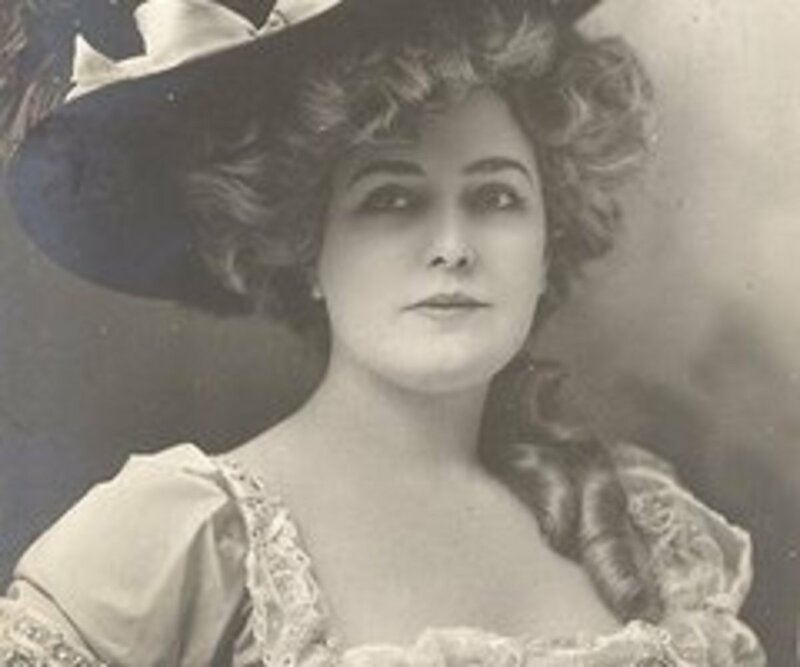 There are many examples of the genre throughout the twentieth century. Steampunk, though not coined as word until 1987, has appeared in movies, art and fiction on a regular basis Since the early part of the 19th century. A computer that runs on candle power. A laser that is charged by a steam engine. A gun that emits a cloud that traps and holds its target. A fleet of highly advanced derigables flying on steam power and using computers. People in fancy Victorian dress, wearing leather aprons, gloves and bug-eyed goggles. The fantastical worlds, machines and dress of steampunk characters has spawned it's own sub-culture and fashion. 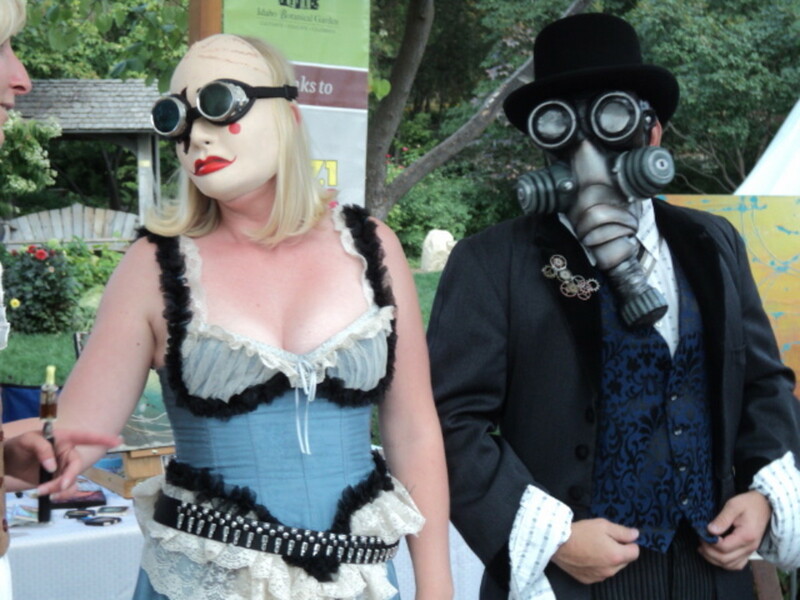 Steampunk clothing and costumes are a popular choice for many sci-fi enthusiasts. The fashion and styles are a balance of form and function that is reminiscent of the Art-Deco and Craftsmen movements with a post apocalyptic retro-futuristic appeal. Many of the visualizations of modern steampunk can be traced back to movies like 20,000 Leagues Under The Sea and Chitty Chitty Bang Bang. Steampunk fashion is a combination of Victorian Age dress with elements of the steam engineer and modern scientist thrown in. Leather helmets, gloves, brass goggles, gas-masks and other elements of retro-futuristic design are at the core of the stye. One notable music group of the 1960s embraced the steampunk fashion without even knowing they were doing it: The Grateful Dead. The fashion of the 1960s that centered on San Francisco and the growing "hippie" movement was originally based on the Victorian era cowboys and electronic musical instruments. 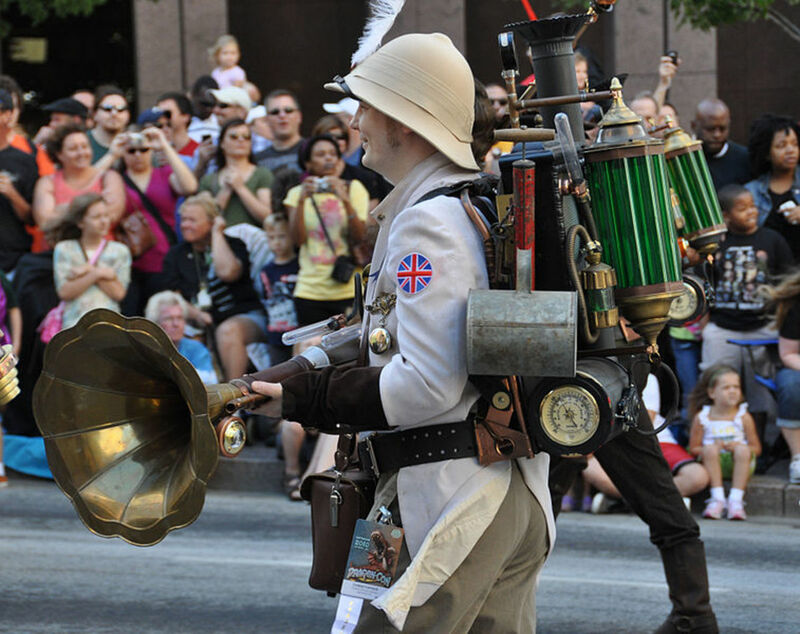 Steampunk outfits often include futuristic equipment, weapons and gadgets. Helmets, goggles, leather trench coats and mechanical devices are also a part of the gear. Here is a look at what it takes to make a good pair of home-made steampunk goggles. 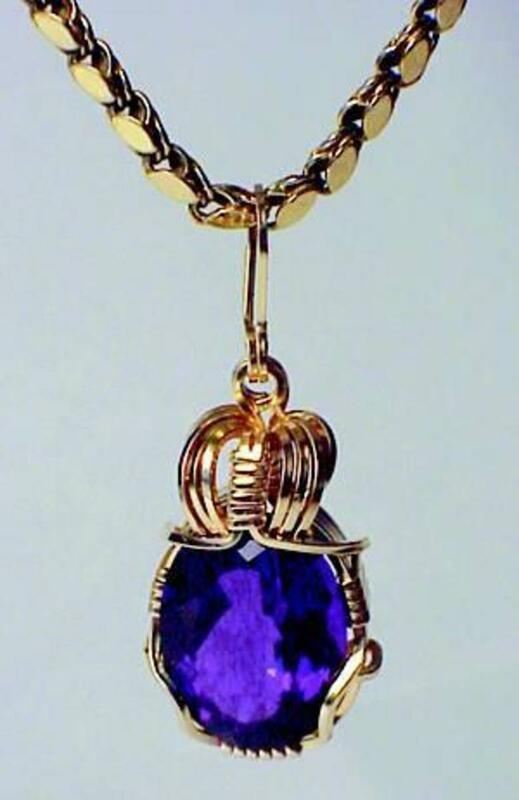 Strap or Band : The strap or band should be made of materials commonly found in Victorian age. Leather, especially if it is decorative, tooled or otherwise enhanced is always a good choice. 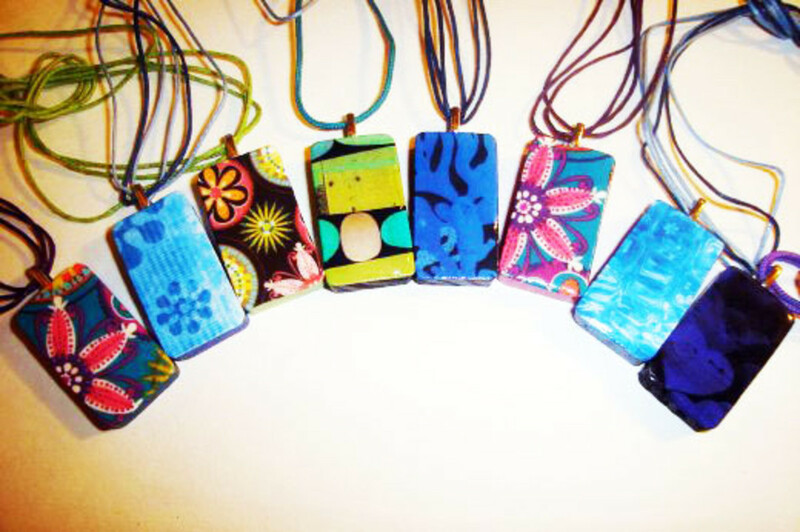 Leather straps are easily converted into bands and it is even possible to enlist the help of your local belt maker in fashioning a great band. Leather is not the only choice though. Rubber, canvas and other cloth also make great staps for steampunk goggles. The Rims : This may be the single most important and variable of all the aspects in a pair of steampunk goggles. The rims should also be made of period materials like brass, copper, steel or nickel plate. 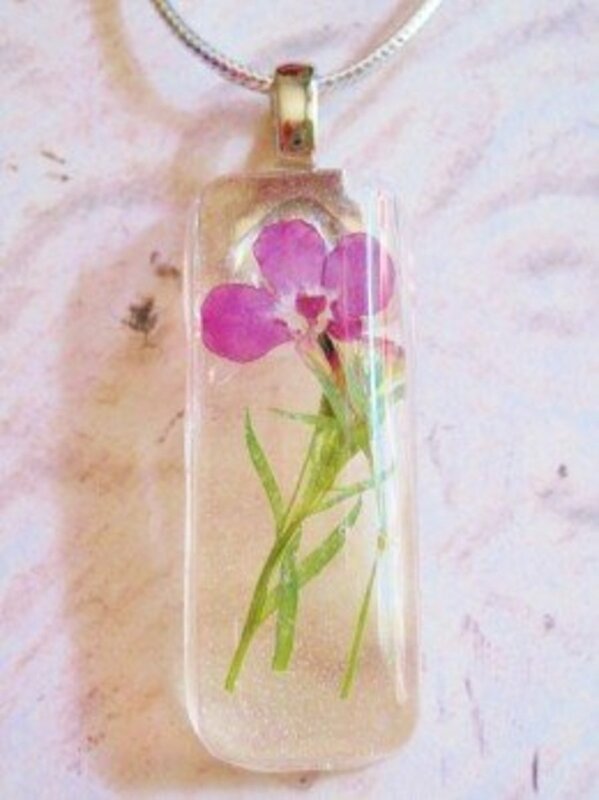 Wood can also be used but never plastic, unless you can disguise it as something else. The rims are often deep set and usually have separate holes for each eye. Old motorcycle goggles, military goggles and welding glasses are great for making steampunk goggles. 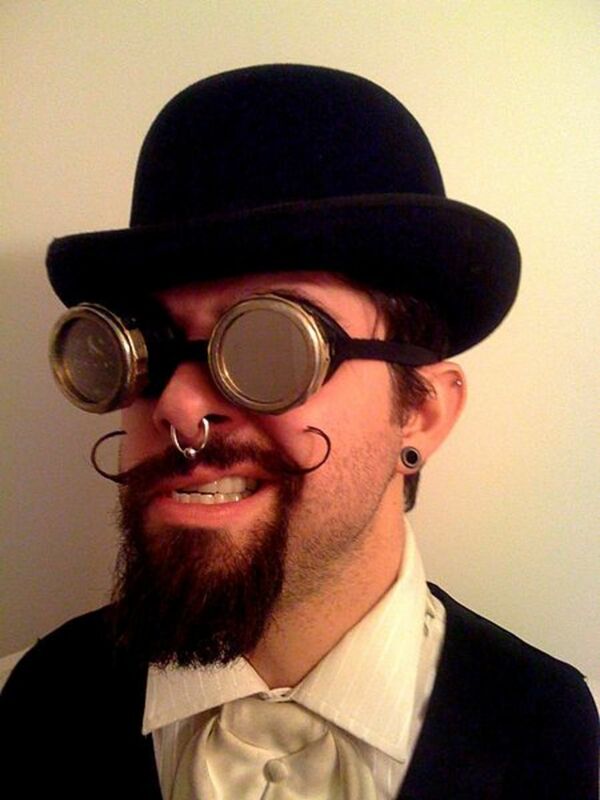 The Lenses : The lenses for your steampunk glasses should be reflective, shiny or mirror finish if possible. Not seeing the eyes is one of the enigmatic qualities of a great pair of goggles. Don't fret if you can't find lenses that fit this description, it is possible to create the effect with another kind of embellishment. The Embellishments : The embellishments are what really says "this is a pair of steampunk goggles" versus just a pair of goggles. The embellishments can be things like levers or buttons on the goggles or something like a second pair of lenses suspended in front of the first. Small gears and watch parts are great embellishments,especially if you put them in front or behind the lenses and look though them. Steampunk Masks : Some steampunk goggles are built into a mask. Masks can range from a gas-mask type mask all the way through purely decorative, character masks. When choosing or making a mask simply follow my tips for making a pair of goggles and you will surely come up with a winner! The Victorian Age was a romantic period during the 19th century when Queen Victoria ruled the British Empire. This time was the peak of British expansion and imperialism; the time when Britain was expanding into Africa, India and Asia. Often viewed as a stuffy period it is also one of free thinking and science. This is the time when electricity, telegraph and steam engines came to be. It is also a peak period of craftsmanship. Not only did an object need to be functional, it needed to be beautiful. Goggles are one of the most iconic parts of a great steampunk costume. There are literally hundreds of styles of these goggles and all are easy to make. There are a few characteristics that each embraces and if you stick to these simply guidelines you too can make a super cool retro-futuristic pair of goggles. One good place to start is an Army Surplus store or similar supply store. They will often have a variety of military goggles, glasses and masks that can be cannibalized for parts. These stores are also great sources for other parts of your steampunk outfit like boots, hats and other bits of military paraphernalia. These stores are also great sources of leather and leather products with the right combination of functionality and appeal for a steam punk costume. Another good place to get parts, pieces or ideas for your steampunk goggles is the cheap sunglass display. Cheap sunglass can be a source of lenses, frame pieces and even the little leather side flaps that block out the light. Automotive/hardware/plumbing supply stores are another good place for parts. At these store you can find brass fittings,screws, pipes and other types of small metal pieces. These can be use to add "functions" to your goggles like levers, focus knobs or flaps. Antique stores/flea markets are prime locations to find items with the old, pre-modern look that steampunk thrives on. Parts of old machines, gears, cogs, springs, bits of leather and even decorative work can all be used to create a great pair of steampunk goggles. I know! I've been a fan of the genre since I was a kid.... Only learned the word steampunk recently. Costumes are cool... I'm in process and will have more pictures soon.